Located at 4th and Grand Avenue near downtown Joplin, the Advanced Training and Technology Center (ATTC) houses high-demand job training programs for Joplin’s first-ever campus location for Crowder College. The building also houses an expansion of incubator space to house business start-ups, a maker innovation space, and services through the Workforce Innovation Board (WIB). It is the mission of Crowder College to provide students access to a quality education. The Joplin Advanced Training & Technology Center (ATTC) provides a convenient location for those who live and/or work in the Joplin region. Students can complete certifications in: Computer-Aided Drafting (CAD), Computer Networking (Microsoft Academy), Advanced Manufacturing Technology, Advanced Welding, and Community Health. Flexible class scheduling provides busy students the opportunity to take classes during the day. Classes are offered in an accelerated format allowing the student to complete a certification in one or two semesters. Students may then pursue an Associate of Applied Science degree at any of our convenient locations, for example, Crowder College – Webb City is only 6 miles from the Joplin ATTC. Experienced, friendly, staff are trained to provide financial aid assistance, placement testing, academic and career advising, and enrollment assistance. Instructors are highly qualified and experienced in the career field. Small class size allows instructors greater opportunity to interact with students. State-of-the-art equipment for students to use. Courses are sequential allowing students to complete quickly. Students who graduate from an A+ accredited high school may use their A+ benefits at any of the Crowder campuses, including the ATTC. 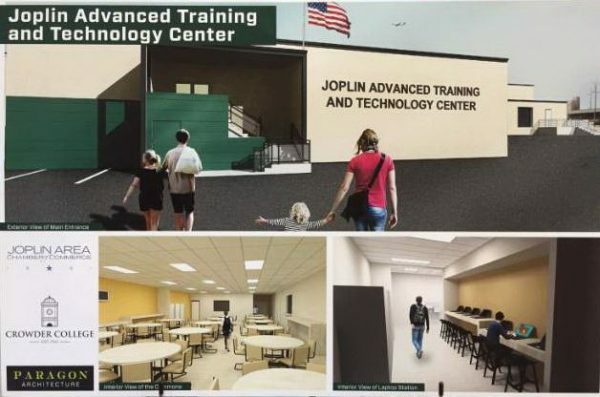 Students training at the Joplin ATTC will be able to utilize the Workforce Innovation Board (WIB) for additional opportunities to pay for the program as well as find employment upon completion of their certification. The WIB will have office space inside the ATTC providing a convenient location for students to connect with Job Center services. Classes will be offered Monday-Thursday with Lab hours on Fridays. Students will be attending classes during daytime hours depending on their program of study. Most programs are scheduled to allow students to complete a program in one semester. This makes it easier for a person to complete a program and then enter the workforce in a short amount of time. The Welding program is currently a two-semester program with 46 hours of training in just 8 months.